The Monkees on a publicity stunt: a phony kidnapping. Filming Dates: July 25-29, 1966. Musical numbers produced by Tommy Boyce & Bobby Hart. �Last Train To Clarksville� by Tommy Boyce & Bobby Hart. �I�m Not Your Stepping Stones� by Tommy Boyce & Bobby Hart. The Monkees reach the finals in a recording contest. While they�re waiting backstage, The Four Swines, a rival group, are on stage performing. Micky bashes their opponents as really seedy lowlifes while Peter defends them when The Swines appear backstage after their act and begin ridiculing the quartet. When The Monkees are announced next, Nick Trump, The Four Swines� manager, signals his clients to sabotage the group�s number by interrupting their performance with a rendition of Beethoven�s Fifth Symphony. Later, Trump turns up at The Monkees' pad to tell them that, because the judges dug Beethoven, they have made the finals and he will get publicity for them. His first stunt goes wrong when girls assigned to rip off David�s clothes at The Vincent Van Gogh-Gogh Discotheque proceed to do the job on Lester Crabtree, a stodgy businessman. His second stunt goes awry when cement The Monkees put their hands in in front of The Chinese Theater happens to be quick-drying, and they become stuck, only to be released by the blow of Trump�s sledgehammer. Then Trump arranges for The Monkees to be kidnapped by two hoods, Horace and George, assuring the kidnapping will make the front pages. The two crooks, in the middle of an assault, agree over the phone with Trump to kidnap The Monkees for $360 per person. At first Horace and George barge into the wrong place where a friendly elderly couple reside. Then they go to the boys� pad at the right address, where they bind and gag Micky, Michael and Peter (all wearing tuxedoes)�and Mr. Schnieder, their pet dummy! Since David is at The Vincent Van Gogh-Gogh Discotheque with his girlfriend, Horace sends George there to kidnap him, but not before he teaches him how to dance by tossing his fists around. At the discotheque, when Nancy, David�s girlfriend, and the other dancers hear that David�s going home to be kidnapped, they insist on being included. David consents, and the mob winds up in the boys� pad, moving and grooving to the tunes of �Let�s Dance On� and �(I�m Not Your) Steppin� Stone.� The crowd gets even larger as more and more people show up with food and chairs including the nice elderly couple with drinks and pretzels and soon they arrange reservations outside their door for entrance. Horace phones Trump and explains the problem, demanding extra pay for the job. Unwilling to write 40 ransom notes, Horace and George decide to get rid of the party patrons. David comes up with an idea to stop the party by switching the jukebox from �(I�m Not Your) Steppin� Stone� to clarinet music�music to which the party goers take with such distaste, that they immediately file out of the pad in less than a minute! Later Trump arrives at the pad to drop the masquerade by telling Horace and George to make sure The Monkees don�t escape, while he goes to the studio to see that his clients, The Four Swines win the contest at 8:00 p.m.�and The Monkees finally realize that they�ve been lured into being sabotaged. They are locked in their room where they devise ideas to escape: first they attempt throwing Peter out of the window to attract passersby until they realize he could land on someone. Then Micky tears up Peter�s bedroom sheets to climb out but Michael states they live on the first floor. Not long after, Micky uses a roll of pennies as brass knuckles to give him a fist of iron to smash through the door only to inadvertently slug George in the face. Finally, Micky, incognito as a mad scientist, convinces George and Horace that he is holding a bottle of nitroglycerin. With only 5 minutes to spare, The Monkees escape and, in a wild but successful chase to elude the hoods set to �Last Train To Clarksville,� arrive at the studio to finish their performance at the band contest. The contest manager reports evidence of foul play in the contest and states the judges report the ofenders (Trump and The Swines) are arrested and jailed. The Monkees are then given special consideration for overcoming many obstacles to stay ion the contest. But Lester Crabtree and The Three Crabs are declared the winners of the contest! When a group of teenagers tear Lester�s clothes off, The Monkees, deciding all it takes to be a star is to have all your clothes ripped off, repeat the procedure on each other. Michael Nesmith is interviewed about people from his past. "A Little Bit Me, A Little Bit You" and "The Girl I Knew Somewhere", both flipsides of the Colgems #1004 single, replaced the old tunes for this episode's retelecast on May 15, 1967. When it reaired on CBS and ABC Saturday, its audio track was once more revised to include the Jeff Barry/Andy Kim song "Do You Feel It Too?." This is Dave Evans' first Monkees script; he went on to compose a further 7 episodes of The Monkees, oftentimes paired with Gerald Gardner and Dee Caruso: Episode No. 8, �Don't Look A Gift Horse In The Mouth�, 15, �Too Many Girls� (a.k.a. "Davy And Fern"), 18, �I Was A Teenage Monster�, 19, �Find The Monkees!� (a.k.a. "The Audition"), 26, �Alias Micky Dolenz�, 53, "The Monkees Race Again" (a.k.a. "Leave The Driving To Us"), and 58, "Mijacogeo" (a.k.a. "The Frodis Caper"). Lester Crabtree's group was originally named The Three Apes. An unused close-up shot from this episode of Peter grinning appears in the first-season main title sequence of The Monkees. The 1986 Colex syndicated edition of �Your Friendly Neighborhood Kidnappers� featured its end credits completely devoid of the caption "Musical Supervision DON KIRSHNER"; Colex unmistakably used these credits from the May 15, 1967 repeat of the episode on NBC (Kirshner having been 86ed from the project by that point). 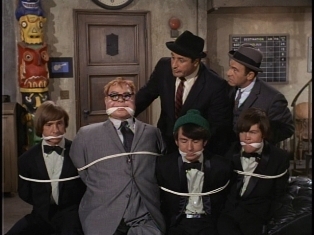 �Your Friendly Neighborhood Kidnappers� marked the first assignment for The Monkees of assistant director Jon C. Andersen. He would continue to serve in this vein for 54 further episodes of the series and in the 1968 movie HEAD, in which he also made a cameo. He also appeared briefly during the end titles for Episode No. 47, "The Monkees Christmas Show", his only onscreen appearance on The Monkees TV series. Boyce and Hart's �Last Train To Clarksville� was cut at RCA Victor Studio A in Hollywood on the very first day of production on �Your Friendly Neighborhood Kidnappers�; little did anyone know that Raybert would incorporate the tune into this episode as one of its featured songs. The boys leave their pad wearing tuxedos, but arrive at the contest wearing their red shirts and grey pants. The BUS STOP sign inside changes position between left and right sides of door. The brunette with bangs is already dancing inside pad but is later shown outside waiting to get in! Though Boyce and Hart's �Let�s Dance On� appeared in �Your Friendly Neighborhood Kidnappers,� it is not present in its end credits' song listing! Of song-miscrediting note is the Boyce-Hart punk anthem �(I�m Not Your) Steppin' Stone,� which makes its debut appearance in this episode; at the time, it was being groomed for release as the B-side of the Colgems #66-1002 single. It's listed as �I�m Not Your Stepping Stones� in the end credits of �Your Friendly Neighborhood Kidnappers,� and as �I�m Not Your Stepping Stone� in the end credits of the next episode, �The Spy Who Came In From The Cool�, and No. 17, �The Case Of The Missing Monkee�. A fourth episode to feature �(I�m Not Your) Steppin' Stone,� No. 11, �Monkees A La Carte�, was the only one to feature the correct title in its end credits' song listing. And then there's that onscreen caption "CASSIUS CLAY WATCH OUT"! Pro Boxer Cassius Clay had converted to The Nation of Islam and changed his name to Muhammad Ali in 1964! At the time of this episode's production in 1966, Ali was already the reigning heavyweight champion of the world. For the first time on the series, The Monkees are seen in an attempt to achieve superstardom. Notice in �Your Friendly Neighborhood Kidnappers�' teaser that The Four Swines have no drummer, despite there being a set of drums present. The Chinese Theater's marquis lists The Monkees as The Machie: Dourantse, Dork, Juhans and Nazemize! The Monkees� address: 1334 N. Beechwood (the same address of the original Monkees� fan club). Here Michael�s wool hat is changed from dark green to bright green. A poster of Las Vegas in The Monkees' downstairs bedroom foreshadows their experiences in Episode No. 46, "The Monkees On The Wheel"; another poster, this one of Smokey The Bear, foreshadows a sarcastic comment made by Michael Nesmith in No. 52, "The Devil And Peter Tork". Notice the jukebox in the Vincent Van Gogh-Gogh Discotheque. It's the same jukebox owned by The Monkees and it will resurface on the show in many future episodes (including Pedro�s Caf� in No. 33, "It's A Nice Place To Visit..."), and in The Monkees' 1969 NBC-TV special 33 1/3 Revolutions Per Monkee, during the "Listen To The Band" sequence. Micky does a variant on the line "I may never play the guitar again!" in Episode No. 20, �The Monkees In The Ring�. The ear trumpet held by the elderly man is also the one used by William Benedict in his role as an Old Man in Episode No. 55, "The Monkees Mind Their Manor". Monkees stand-ins David Price (for David), David Pearl (for Peter), Richard Klein (for Micky) and the late John London (nee John C. Kuehne, for Michael) can be seen as extra spectators in the contest sequence in this episode's teaser and dancing in the party crowd scene at the pad. Price has 2 other unbilled cameos in The Monkees' first season: in Episode No. 15, �Too Many Girls� (a.k.a. "Davy And Fern"), as the guy shackled to an easy chair Micky, Michael and Peter mistake for their real mate David, and in No. 21, �The Prince And The Paupers� as the infamous Chemist, and Pearl cameos as Freddy Fox III in No. 29, �The Monkees Get Out More Dirt�. This is the first episode of the series to feature cameos of Monkee stand-ins. Pearl was Jones's closest buddy, as well as The Monkees' tour manager/personal co-manager; Price was The Monkees' head roadie; and London previously teamed up with Michael Nesmith, Michael Martin Murphey, Bill Chadwick and Owen Castleman as a large folk ensemble called The Survivors, later grouped with Murphey and Castleman as The Monkees' Colgems label mates The Lewis & Clarke Expedition, and later on played bass for longtime pal Nesmith's First National Band. Price, Pearl and Klein would cameo in a lion's share of second season segments. In the �I�ll Be Back Up On My Feet� musical number in Episode No. 14, �Dance, Monkee, Dance�, The Monkees wear the exact same tuxedos they're wearing here--compleet with top hats and canes! Stock footage of the launching rocket seen in this segment is reused in Episode No. 17, �The Case Of The Missing Monkee�. The superimposed blurb of the yellow-orange light bulb which pops in and out over Micky's head previously popped in and out next to Archduke Otto (Theo Marcuse) in the premiere episode, �The Royal Flush�. In this episode and No. 8, �Don't Look A Gift Horse In The Mouth�, and No. 12, �I've Got A Little Song Here�, The Monkees' bedroom is on the first floor. 5 episodes later, in No. 9, �The Chaperone�, it would be seen upstairs. Interestingly, in Episode No. 26, �Monkee Chow Mein�, Micky and Michael sleep in the upstairs bedroom, while Peter and David sleep in the downstairs bedroom. The back of the first album, The Monkees (which would be released the following week), uses stills from this and the next episode, �The Spy Who Came In From The Cool�. This is the first time a Monkee is seen mimicking Groucho Marx (Micky); the second is in Episode No. 51, "The Monkee's Paw" (Michael). Another episode, No. 30, �The Monkees In Manhattan� (a.k.a �The Monkees Manhattan Style�), would use The Marx Bros.' film Room Service (RKO, 1938) as inspiration. A second Monkees episode to feature a band contest is No. 56, "Some Like It Lukewarm" (a.k.a. "The Band Contest"). This is the first Monkees episode to feature classical music. The scene of The Monkees putting their hands in cement in front of The Chinese Theater foreshadowed an actual crowning achievement for the band: their star on The Hollywood Walk Of Fame awarded on July 10, 1989 at 6675 Hollywood Blvd., for their contribution to the recording industry. In the party scene, the outfit on one of the girls resembles the exact same outfit worn by Ann-Margaret in the "I Got A Lot of Living To Do" scene in the 1963 Columbia Picture Bye Bye Birdie, which also featured a role by future Monkee guest Milton Frome (�The Monkees On The Line�, "The Monkees Blow Their Minds"). The late singer/actor Andre Philippe (Trump) had a long friendship with Monkees developer Paul Mazursky and appeared in Mazursky's films Alex In Wonderland (MGM, 1970), Harry And Tonto (20th Century-Fox, 1974), Bob & Carol & Ted & Alice (Columbia, 1969), Down & Out In Beverly Hills (Buena Vista, 1986), Scenes From A Mall (Touchstone, 1991) and The Pickle (Columbia, 1993). Philippe succumbed to congestive heart failure April 29, 2007 at age 79. The late Louis Quinn (Horace) portrayed Roscoe on 77 Sunset Strip (ABC, 1958-64). Among his other credits are an uncredited part in Frank Sinatra's 1960 Ocean's 11 and the 1966 musical comedy Las Vegas Hillbillys, which included Monkees guest stars Arlene Charles (the genie from �The Spy Who Came In From The Cool�) and Richard "Jaws" Kiel (the monster in �I Was A Teenage Monster�). Quinn also appeared in the 1975 film Keep Off! Keep Off!, with Micky Dolenz. Ken Del Conte (Swine #1) and Monkee guest Laurie Main ("The Monkees Mind Their Manor") was seen in several geust roles on Daniel Boone (ABC, 1964-70), including "The Tortoise And The Hare (#8405, Sept. 23, 1965), which included another Monkee guest, James Griffith ("The Monkees In Texas"). The late Georgia Schmidt has an uncredited role in this episode as the Old Lady; she reappears on this show as Jane in Episode No. 40, "Monkees Marooned". Schmidt previously appeared with Monkee guest Peter Brocco ("Monkee Mayor") in a Feb. 25, 1965 episode of Bewitched (ABC, 1964-72), "Eye Of The Beholder."